"HOW TO JUDGE DEBILITATED PLANETS IN ASTROLOGY"
One of the vital aspects of predictive astrology is the strength of the planets. The planets in their own planetary sub-periods give the results of their general and particular significations as per their natal and transit strength. Debilitation is a measure for ascertaining the strength of planets. While in its sign of debilitation, a planet is considered weak. When the planet is weak on account of its placement in its sign of debilitation, the planet delays its results, fails to protect its significations fully and causes stresses and strains when under the close affliction of functional malefic planets. During the period of a debilitated planet one meets with sorrows, unhappy events, is timid, miserable and faces worried conditions. So, this is a negative factor as during its sub-periods, it denies, delays and/or deteriorates the opportunities and significations in life of an individual. The operational period of a planet whether strong or weak, whether benefic or malefic etc., is of great importance and the same is very pertinent in this case also. Saravarth Chintamani indicates that the native lives by despicable and low means, forsaken by people and suffers from disease. As per Saravali a debilitated planet during its main/ sub-periods will trouble the native through his enemies, defeat and poverty, even if he were a king. Saravali declares the debilitated planets fully inauspicious. Such planets lose their capacity to do well in addition to becoming capable of bestowing malefic effects, in full. A lot can be read on the subject in print in clear contravention of the hints given by ancient astrological writers in the name of Raja Yogas arising out of cancellation of debilitation of debilitated planets. It does not appear to be true in all cases. The so-called rise in life around the age of 33 years is experienced by an individual only in cases where there are other Raj Yogas in the horoscope and the main periods of the Yogakaraka planets are in operation. This in itself shows/supports the applicability of delay caused by the weak planets due to debilitation. The inference of some modern writers or the ancient commentators that the Neechbhanga Raj yoga gives rise in life after the age of 33 years shows the truth of the classical dictum on results of debilitated planets. A debilitated planet in angular position to the Moon aspected by benefics, its dispositor being strong by exaltation or occupying own house or in an angular position to the Moon/lagna etc. are the factors advanced by the proponents of the concept of Neechbhanga Rajyoga as the basis for these so called cancellation of debilitation. In a way this gives a little strength to the planet that is weak due to debilitation and can reduce the malefic effects of the debilitated planet to a limited extent. In no way this can match the Raj yoga (combinations of fortunes) caused by a Yogakaraka planet. A debilitated planet gives its results for the houses ruled, its significations and the planets/houses it aspects/occupies close to the most effective point. In case it is further afflicted by way of placement in dusthanas, in conjunction with malefic planets/combustion, it damages all sectors mentioned in the earlier sentence. If two debilitated planets mutually and closely aspect each other and one of them is a functional malefic planet, the said planetary influence produces disastrous results pertaining to the weak functional benefic planet. During the sub-periods of these debilitated planets the natives suffered so much that the indications of both the houses where these planets are located almost got destroyed because in the sub-period of any planet, problems in the relative areas are indicated. The author has closely observed such combinations and have found that in case the period of such a planet operates, it gives overall negative results through delays, denials and sufferings caused by the transit planetary influences. In case the main period of such a planet does not operate, its sub-period in the main periods of other planets results in delay in the general growth of the individual. Of course, it goes without saying that whenever the sub-period of debilitated planets, even with so called debilitation cancellation in operation, is clubbed by unfavorable transits or in the main periods of functional malefic planets, it really gives very bad results. It does not promote or protect its own general and particular significations. On the other hand, it can cause sufferings to the native. The learned readers would find the efficacy of this point of view in the analysis of horoscopes. It can and acts as a very powerful predictive tool because one rarely finds a horoscope without debilitated planet(s). In the sub-periods of functional benefic planets, which are in the state of debilitation, the significations ruled not only lack protection but the same are also delayed, denied or face deterioration. To augment the strength of the debilitated planets the natives are recommended to wear planetary Kavach in auspiciously elected times to (i) protect the significations ruled by these planets during transit afflictions; and (ii) to promote the significations of these planets. During the sub-period of debilitated Sun one finds that social circles are ignoring the person. Some conflict springs up with government authorities. The person develops fear of unfavorable action from government. The son, father or husband may find trouble. One has to put in lot of efforts for success and recognition. One gets little time and peace for attending to one's spiritual pursuits. During the sub-period of debilitated Moon, the mental peace of the person is lost. One's mother or wife may not enjoy good health. The property matters may give unfavorable results. People try to avoid the person. If such a debilitated Moon is under the close influence of Rahu or the lords of the eighth and twelfth houses, the person gets involved in many vices and loses mental peace. One is vulnerable to epileptic fits. During the sub-period of debilitated Mars one is angry and suffers from injuries due to rashness. One suffers from blood impurities, hypertension and multiple boils. If such a debilitated Mars is under the exact or close affliction of Rahu one becomes vulnerable to Cancer. One incurs losses in property matters and disputes. During the sub-period of debilitated Mercury one is confused, sensitive, slow in decision making and one suffers from lack of confidence and nervous pressures. The peace of mind is disturbed. One becomes vulnerable to convulsions, paralysis and skin diseases if the debilitated Mercury is under the influence of Rahu, especially from the malefic houses. During the sub-period of debilitated Jupiter one suffers from liver disorders and fevers. One cannot concentrate on studies. There are obstructions in one's spiritual pursuits. One becomes selfish. One suffers on account of problems to one's male progeny and husband. If such debilitated Jupiter is badly placed and is under the severe affliction of Rahu/Ketu or the lords of the eighth or twelfth houses, one becomes vulnerable to liver cirrhosis, jaundice and diabetes. During the sub-periods of debilitated Venus, one faces loss of comforts. One's wife suffers from ill-health. In the case of females they suffer from urinary infections, malfunctioning of uterus and fallopian tubes. One becomes vulnerable to skin problems, eye-diseases and renal problems if debilitated Venus is severely afflicted by Rahu/Ketu or the most malefic planet. During the sub-periods of debilitated Saturn one has to struggle more for success. One may suffer from bone fractures, pain in legs or spinal problems. One may get involved in leading the low class people or laborers. One does not enjoy good social respect. 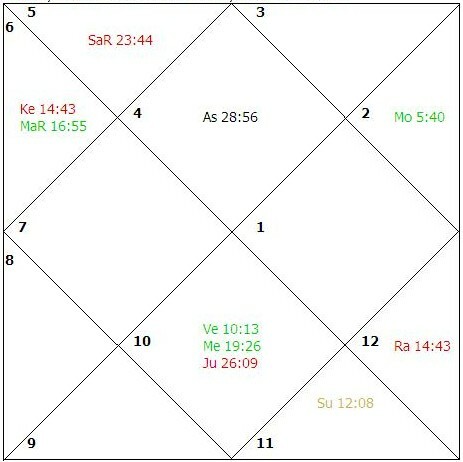 During the sub-periods of debilitated Rahu one is vulnerable to vices and loss of reputation. During the sub-periods of debilitated Ketu one confronts many unfavorable incidents and failures. During the sub-period of debilitated lord of the first house one suffers from health problems and loss of status. The debilitated lord of the first house when severely afflicted by Rahu/Ketu or the most malefic planet makes one vulnerable to addictions and loss of status. During the sub-period of debilitated lord of the second house one loses wealth, status and harmonious relationship. The debilitated lord of the second house when severely afflicted by Rahu/Ketu or the most malefic planet makes one vulnerable to the diseases of eyes, thyroid, problems to teeth, problem of speech and results in sorrows on account of tragedy to male relations. During the sub-period of debilitated lord of the third house one faces isolation and one's younger brothers face troubles. The debilitated lord of the third house when severely afflicted by Rahu/Ketu or the most malefic planet makes one vulnerable to the breathing problems and financial losses through business ventures. During the sub-period of debilitated lord of the fourth house one loses mental peace and properties and one's mother and education suffer. The debilitated lord of the fourth house when severely afflicted by Rahu/Ketu or the most malefic planet makes one vulnerable to the loss of assets, loss of parents, cardiac disorders and unhappiness through marital discord. During the sub-period of debilitated lord of the fifth house one's concentration is lost and one suffers unhappiness on the performance of children. The debilitated lord of the fifth house when severely afflicted by Rahu/Ketu or the most malefic planet makes one vulnerable to the loss of children, losses through speculative investments, liver cirrhosis, stomach disorders, spinal inflammations and gall bladder problem. During the sub period of debilitated lord of the sixth house one suffers from ill-health arising out of acidity, inflammation of intestine, renal disorders, etc. The debilitated lord of the sixth house when severely afflicted by Rahu/Ketu or the most malefic planet makes one vulnerable to losses through thefts, fires, litigation and cheatings. During the sub-period of debilitated lord of the seventh house one suffers from problems in marriage, partnerships and in foreign lands. The debilitated lord of the seventh house when severely afflicted by Rahu/Ketu or the most malefic planet makes one vulnerable to marital discord, cheating in partnership business and suffers from severe difficulties in foreign lands. During the sub-period of debilitated lord of the eighth house one suffers from obstructions and delays and one's life is threatened. The debilitated lord of the eighth house when severely afflicted by Rahu/Ketu or the most malefic planet makes one vulnerable to fatal accidents and one's father may suffer financial setbacks and severe health problems. One also faces divorce in marital relationship. During the sub-period of debilitated lord of the ninth house one's father suffers from problem and the person gets setbacks in life. The debilitated lord of the ninth house when severely afflicted by Rahu/Ketu or the most malefic planet makes one vulnerable to physical handicap and prolonged health problems. During the sub-period of debilitated lord of the tenth house one gets professional setbacks and has to move away from his native place. The debilitated lord of the tenth house when severely afflicted by Rahu/Ketu or the most malefic planet makes one vulnerable to arthritis, government action, loss of reputation and sufferings on account of one's child(ren). During the sub-period of debilitated lord of the eleventh house one faces loss of income and trouble to friends and elder brother(s). The debilitated lord of the eleventh house when severely afflicted by Rahu/Ketu or the most malefic planet makes one vulnerable to blood Cancer, isolation and penury. During the sub-period of debilitated lord of the twelfth house one faces separation in marital relationships and loss of comforts. The debilitated lord of the twelfth house when severely afflicted by Rahu/Ketu or the most malefic planet makes one vulnerable to drug addiction, imprisonment and prolonged hospitalisation. It is imperative to seek astrological help through preventive horoscope analysis and strengthen one's debilitated and other weak planets to avert setbacks in life. It is also necessary to perform propitiatory astrological remedial measures for the afflicting planets to enjoy a peaceful life. Hereunder, I would cite a few cases, which have prompted me to elaborate this subject here. Birth: February 24, 1950, 1713 hrs.. The sign Cancer rises in the ascendant and Jupiter, Saturn, Rahu and Ketu are the functional malefic planets. In the D-I chart, the lord of the sixth house, Jupiter is weak as it occupies its sign of debilitation and is in old age. This weakness shows that the native is vulnerable to losses through disputes and litigation. The lord of the second house, Sun, is badly placed in the eighth house. Saturn, the most malefic planet, occupies the second house. As per traditional view the debilitation of Jupiter is cancelled because of Saturn occupying angular house with reference to the Moon. However, the weakness of Jupiter did not improve. The native suffered from professional debacle due to the badly placed Sun, ruling the second house. The tenth lord, Mars, is closely associated by Ketu. Jupiter's sub-period in its own main period has not created any raja yoga but instead has been disastrous for the native. He had been entangled in a false case and dismissed from the Government service without any charge sheet and enquiry. Top-level political and official sympathies did not prove beneficial even after persistent efforts and his appeal being granted by the concerned Minister. The following sub-period of the lord of the eighth house also failed to help as the most malefic planet was occupied the second house. The native was suggested propitiatory remedial measures for Saturn, Ketu and Jupiter and strengthening measures for Mars, the Moon, the Sun and Venus. The performance of astral remedies blessed the native with reinstatement of his official position. Birth: November 5, 1940, 0553 hrs. The sign Libra rises in the ascendant and Mercury, Rahu and Ketu become functional malefic planets. The Sun, Venus and Saturn are in their signs of debilitation. As per the classical commentaries, the debilitation of all these three planets stands cancelled due to the placement of Venus and Mars in angular house from the Moon and the Sun occupying a house, angular to the ascendant. 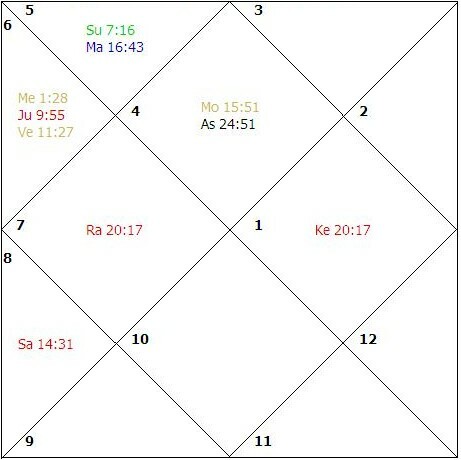 As per Systems' Approach these planets rule the houses connected with self-health (first house), children (fifth house) and gains (eleventh house). In addition to these the lord of the seventh house is placed in the twelfth house along with Rahu and debilitated Venus. The lord of the house of losses occupies the house of family. The lord of the seventh house, which happens to be the lord of the ascendant of D-IX as well, is weak as it is badly placed in the chart and is in old-age. Rahu-Ketu axis is close to the most effective points of the houses occupied and afflicts the houses occupied and aspected. In dasamsa, the sign Aries rises and the Sun is exalted in lagna. The lord of the ascendant, Mars, also occupies its sign of exaltation. Saturn is also exalted in D-X. The Moon, lord of the tenth house of the main chart, occupies the sixth house in D-X. The exaltation of the Sun, Mars and Saturn in dasamsa made little difference as these planets are week in the rasi chart. In navamsa, the lord of the ascendant, Mars, is badly placed in the sixth house. The Moon, Venus and the ascendant are afflicted by Ketu. 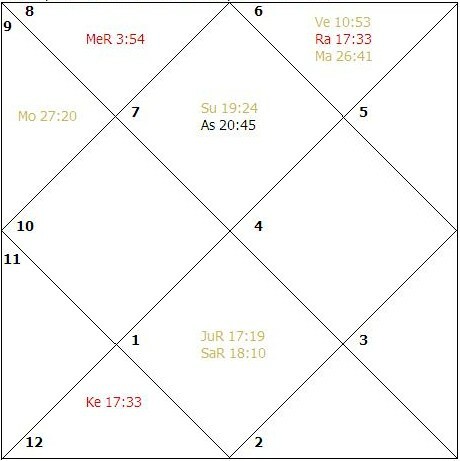 Due to concentrated and multiple unfavorable influences on the significators for marriage, Mars, Venus and Mercury, and on house connected with happiness of marriage, the twelfth house, the native’s marriage was inordinately delayed and he married at the age of 55 years primarily for companionship. In spite of enjoying a senior post the native did not enjoy the matching authority and respect due to weakness of the majority of the planets. Birth: October 21, 1940, 1200 hrs. The Sun and Saturn occupy their signs of debilitation. The Sun rules the ninth house and Saturn rules the third house ruling initiatives. The initiatives of the native have not turned fruitful to their potential. Rather he got average results to his hard work in relation to the long cherished goals. The sign Libra rises in the ascendant and Mercury Rahu and Ketu become functional malefic planets. 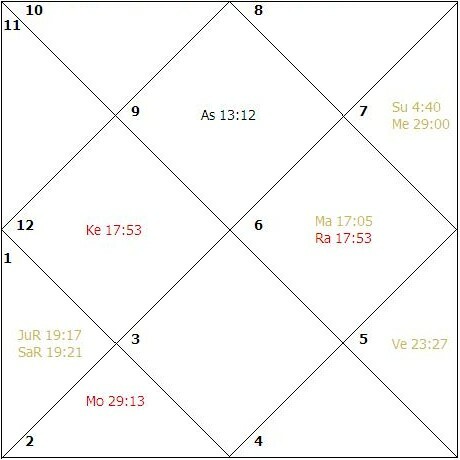 The lord of the fifth house Mars is closely conjunct with Rahu. The Sun is weak as it is placed in its sign of debilitation. Jupiter is weak due to the weakness and exact affliction of its dispositor. Mercury is weak as it is placed in the state of old-age. The Moon is weak as it is badly placed in the chart and is in old-age. Rahu-Ketu axis is close to the most effective points of the houses occupied and afflicts the houses occupied and aspected. All these combinations had put the significators of the fifth house in focus. The native was blessed with a son in 1972. The main period of Jupiter was operative. From 1979 onwards, the main period of debilitated Saturn started. The native revealed that during the 14 years age of his elder son there was hardly any time when he had kept good health. The eyesight is weak; he had high temperatures, jaundice, damaged liver, etc. The younger one who was born after 13 years of his elder brother also had repeated health problems. The reason is that whenever the weak significators are transited/ aspected by functional malefics and/or Rahu and Ketu the native suffers from problems related to these areas. In this case the functional malefic is the Moon, who due to its fast speed comes into contact with weak significators more often. The exact affliction to weak planets causes persistent problems. The weakness of Saturn as lord of the third house makes the person lethargic. Birth: August 24, 1957, 0500. The sign Cancer rises in the ascendant and Jupiter, Saturn, Rahu and Ketu are the functional malefic planets. The prime significators of marriage in this case are the Sun and Venus. The significator for marriage, Venus, is weak as it is in its sign of debilitation and its dispositor is in the state of infancy The weak Jupiter is closely conjunct with the functional malefic planet Jupiter and is afflicted.. As per the classical commentators the debilitation of Venus would have been cancelled as the sign where Venus gets exalted is placed in the same sign in which Venus is placed. However, nothing of the sort happened. The native had crossed the age of 31 years when his parents contacted the author for suggesting astrological remedies for expediting the marriage, which was eluding in spite of the native enjoying good health, personality, family status and employment. The main reason was the operation of main period of debilitated Venus, which is the significator for wife. In D-IX as well, the lord of the ascendant was associated with the debilitated Moon. Venus is conjunct with Rahu. The planets enjoying strength were Mars and the Sun. The Sun had already had his sub-period in the main period of Jupiter. The remedial measures were suggested for strengthening of Venus and Mars and propitiating Rahu, afflicting the second house by way of aspect and Jupiter. The marriage of the native was solemnized in early 1990 with the help of remedial measures.